It's been a long time since my last Used Up #7 post and the drawer that stores my empties was starting to overflow, so I thought it was about time I put together a post. Actually, this is only about a third of the stash of finished products I've accumulated, but I didn't want this post to get out of control! Since the La Roche-Posay Serozinc spray finally became available in the UK, I've racked up quite a few bottles of it. Caroline Hirons, the skincare guru that a lot of us whole-heartedly trust, raves about this facial mist. If it's good enough for Hirons, that's the only seal of approval I need! Made up of a relatively simple solution (water, zinc sulphate and sodium chloride), this spritz works to mattify the skin, kill blemish bacteria and heal imperfections. Whenever I'm suffering from a breakout or two, I generously spray this mist over my face, after cleansing and before using serum. Any angry spots are zapped and irritation is soothed, helping my skin to recover more quickly. I also use it as a refreshing, mattifying mist at the height of summer, when my complexion gets shinier during long days. During winter, my eyes tend to suffer. They can get quite sensitive and irritated, with the delicate skin around them getting really red and dry. 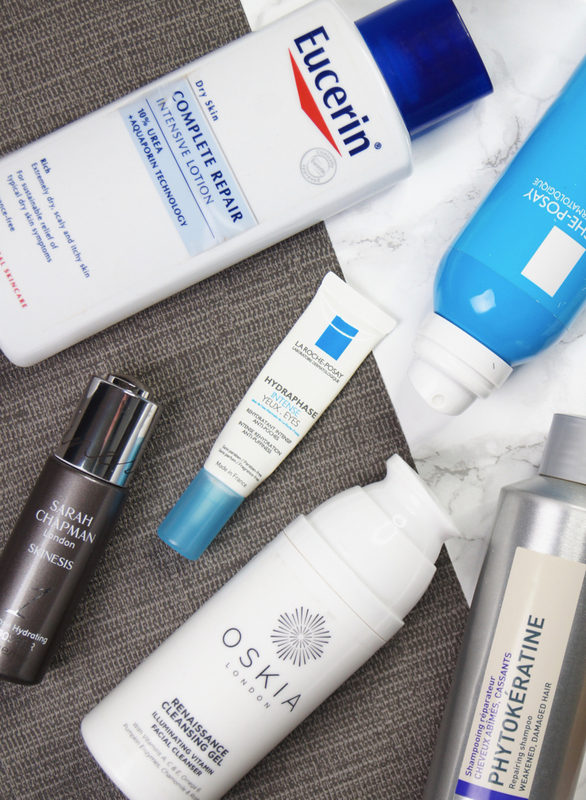 So, to help keep the moisture levels up, I always use more intensely hydrating eye creams. Considering the name, I was expecting the La Roche-Posay Hydraphase Intense Eyes to be seriously effective at moisturising, but I was slightly disappointed with it. Although it has a hydrating gel texture and it soothed my eyes initially, it absorbed too quickly and felt uncomfortably tacky, which only made my eyes feel worse. I used up the whole tube, simply to get rid of it, but I had to use it in conjunction with another product which wasn't ideal. I won't be repurchasing, which is a shame as I'm such a huge fan of La Roche-Posay and rarely find their products don't work for me. The Oskia Renaissance Cleansing Gel is another cult favourite in the beauty world and is seriously hyped. This bright orange gel transforms into a silky oil as you massage it in. Full of fruit acids and enzymes, it works wonders to gently exfoliate and brighten the skin without you even realising it's happening. Even after one use, my skin always feels so much softer and smoother, and any skincare I use afterwards absorbs ten times more effectively. It's lightweight and not at all greasy, so when you remove it, your skin feels thoroughly clean without being tight or stripped of all moisture. Whilst the Oskia Perfect Cleanser is my holy-grail, as it's extra nourishing and complements my dry skin well, I love using the Renaissance Cleanser in the mornings for more of a refreshing clean. All year round, but especially at this time of year, moisturising my body is a beauty chore that I force myself to do. It is a pain, but I always notice such a difference in my skin when I regularly moisturise and feel so much more body confident as a result. I've just got used to keeping a pot of body butter on my bedside table and slathering it on before bed. As always, my favourite formula is The Body Shop Wild Argan Oil Body Butter. All of TBS's body butters are incredibly rich and intensely hydrating, which I personally love and this one is ultra thick. If you hate feeling greasy or have oily skin that's prone to break-outs, then you may want to give this a miss, as it could be a bit heavy. What I love most about the Wild Argan Oil scent is that it smells nice, but it has quite a subtle scent that doesn't keep me awake at night or give me a headache. Another body product I really appreciated having in my stocks over the past few months, was the Eucerin Dry Skin Intensive Body Lotion. Thanks to Pixiwoos, who brought this to my attention in one of their videos, this has been the body lotion I've worn when going out or for special occasions. Body butters are super dense and can feel quite slick on the skin, so I can't stand applying them in the morning or when I'm getting dressed up. Instead, this lotion creates the most gorgeous sheen that leaves skin glowing and glossy, but without feeling wet or sticky. It's unscented, making it ideal for sensitive skin, but it also won't compete with or overpower your fragrance. I'll definitely be buying another bottle of this ready for getting my pins out during S/S. Next up are three products from Photo. Ages ago, I thought I'd try some sulphate-free haircare to see if it improved the condition of my hair. 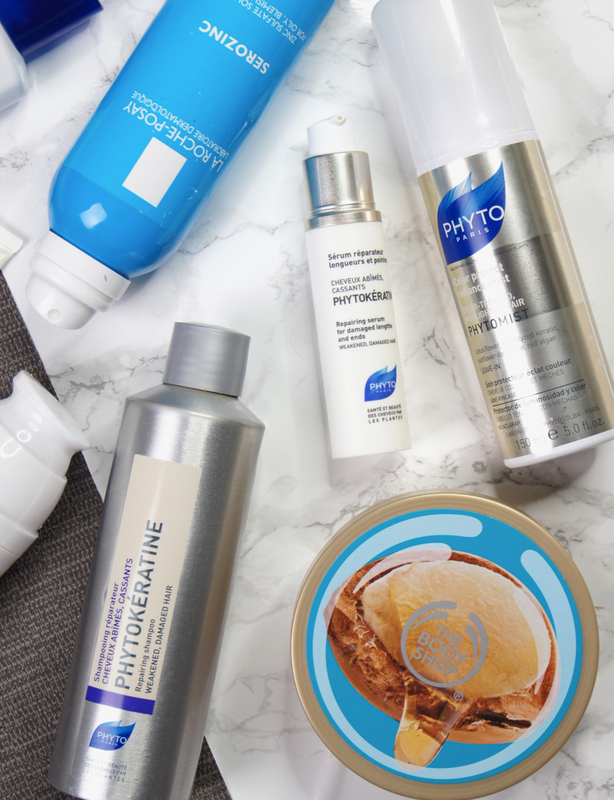 Turns out, it didn't seem to make much difference, but I did discover a few brands and products that I really loved, so it all wasn't in vain. Photo products are full of amazing natural ingredients and leave out any nasties, to help care for your hair more gently. One of my favourite finds was the Phyto PhytoMist Color Protect Radiance Mist, which is just the most lovely leave-in conditioner. It's so lightweight and adds just enough extra moisture, without leaving hair lank and greasy. The Phyto PhytoKeratine Reparative Shampoo is another product that I've incorporated in to my regular routine, as it cleanses my locks effectively, without making them feel dry or stripped. Finally, the Photo PhotoKeratine Reparative Serum was something that I used up, but won't repurchase. Whilst it's a nice, lightweight creme serum and would suit anyone who has very fine hair that gets greasy easily, its not quite intense enough for my thicker, longer lengths. I need more of an oil to fully tame my frizzy barnet, so this cream didn't quite cut the mustard for me. Last, but by no means least, we have one of my all-time skincare must-haves, the Sarah Chapman Intense Hydrating Booster - a little bottle of delicious dewiness that brings dry, dehydrated skin back from the brink. The oil-free silky elixir instantly drenches the skin with a comforting blanket of juiciness, which helps to plump and re-balance areas of dehydration and dryness. Ingredients like beta-glucan also help to fight bacteria, to prevent break-outs at the same time as nourishing the skin. If you couldn't tell from that slightly OTT serenade, I am obsessed with this stuff and it won't be eliminated from my routine any time soon. I already had a spare bottle in my stocks to reach for when I used up my last drop of this serum, so no frenzied dashes to Space NK are required this time, fortunately! Which products have you polished off, recently? You've tried out some amazing products here, I love the sound of that facial mist, definitely going to be picking that up!! I definitely need to try out these brands. 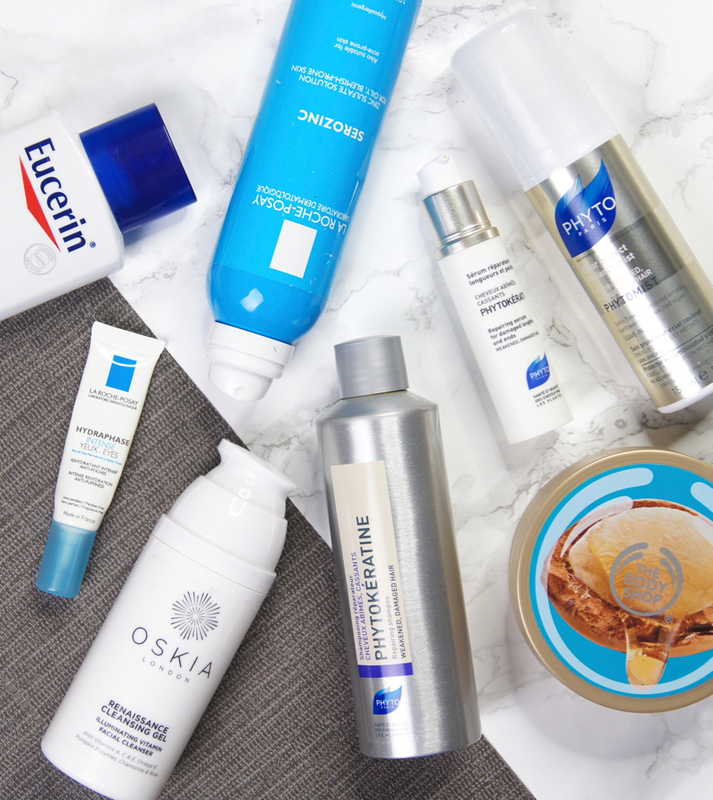 I've heard such good things about Oskia, La roche posay as well as sarah chapman. Great post. I love reading people's empties posts. My bottle of Oskia feels a bit too light, and I know it's on its way out! It's just so hard to go back to using one pump when you start using two. But I so agree, nothing makes my complexion look as good as this cleaner. I really like the sound of the Sarah Chapman booster. I've only tried a sample of the overnight facial, but I need to add some of her products to my night-time routine soon.